So you’ve got a property, and want to make some money renting it out, all you need to do is get the tenant right? I too wish that was the case, but it’s not as simple as that. You have a long list of things to do before you can be called a landlord, some of these things are legal obligations, some relate to maintenance of the property to be let out according to standard, while the rest could be marketing. Be sure you take a look at this landlord checklist before renting out your property. It’s possible your last tenant left several months ago, or you just finished construction work on the property, whichever the case, your property needs to be cleaned up and made presentable before renting it out. The small cost of hiring professional cleaners to make the property look its best could be a factor that could make you rent faster than anticipated. Who wouldn’t want to move into a clean, attractive house? It is during this cleaning period that you get to remove all personal items of previous occupants and also decide whether you want to rent the house as furnished, part-furnished or unfurnished. So, before you get carried away with the other numerous tasks begging for your attention, get the cleaning done! You know, all those disputes over what was in the house before tenant took possession could be eliminated if a thorough inventory was carried out before the tenant moved in. Although you could do the inventory yourself, it is advisable to let an expert carry it out to be sure every appropriate item is included, plus you also get an independent inventory. You get to know the importance of a landlord inventory when you get embroiled in a deposit dispute. One of the responsibilities of a landlord is to keep the property safe from hazards and dangerous things. Landlord must ensure that before renting the property, all appropriate security amenities are fixed like locks, fire and burglary alarms, etc. This is a legal requirement you must meet and then check off your checklist, else you could become liable in a lawsuit. Before the tenant comes knocking, get all your legally required certificates which you must present to the renter in California before the tenancy begins. One of such certificates is a valid Gas Safety certificate. Another is an Energy Performance Certificate (EPC) which is used to show the prospective tenant how energy efficient the house is, in order to help them cut down on energy bills. So, before even beginning to market your vacant property, you’ll need to get this off your landlord checklist as the ratings must be quoted in all advertisements of the property. A new EPC is gotten per new tenant. In California these two certificates must be presented on the day the tenancy begins to run. As a landlord of course you wouldn’t want to rent your property to anyone using it for illegal purposes. To avoid becoming entangled with police investigations or worse being seen as an accomplice, one of the items on your landlord checklist before renting to a prospective tenant is to get a reference list for that tenant. Tenant referencing is very important and must include basic information, details about current or previous place of work, bank, financial and credit statements, and reference from current landlord. You can go about getting this reference yourself or hiring competent professionals to handle it in thorough details. Of course, your tenant can’t move in without a tenant rental agreement, so that should be one of the things on your landlord checklist before renting out your property. Consult an experienced lawyer who will draft an agreement to reflect your instructions while also complying with appropriate statutes. The agreement will provide for things like giving you the right to ask for rent and obligating the tenant to pay rent. It will also include acts forbidden in the premises like bringing in animals, cultivating drugs or using property as a base for criminal activities. Insuring your rental property is beneficial, especially in covering for those unforeseen circumstances that result in need for costly repairs. In case you already have one, before renting out check that the policy is in order or that they reflect any necessary changes. 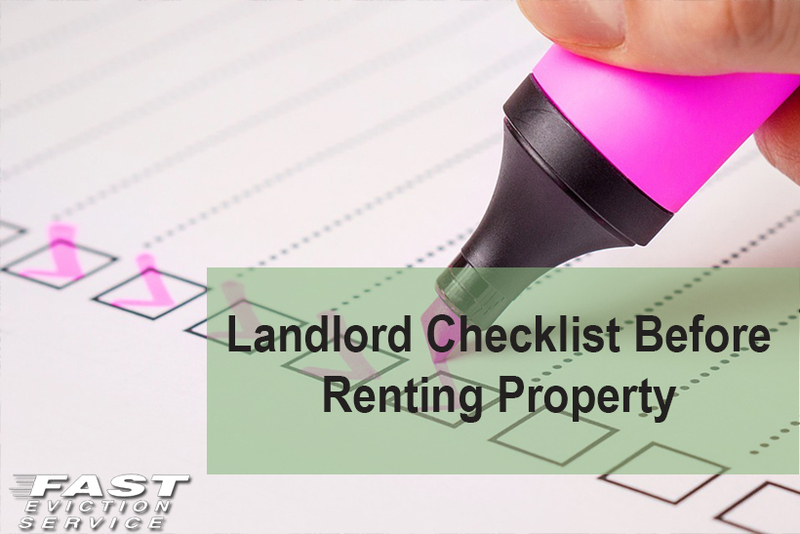 Be the smart landlord, guarantee a smooth time for yourself and your prospective tenant by ensuring all the above points are ticked off your landlord checklist before renting.